A Nashville non-profit is partnering some of Music City’s top songwriters with the city’s most at-risk populations to help them share their stories. The Beat of Life , founded by Jeni Dominelli, is about to release its first album featuring songs written by those in prison, people suffering from mental illness, and victims of bullying. Dominelli launched the Beat of Life after reflecting on her own battle with depression as a teenager. She said music became her therapy, which is how she came up with the idea to help others. The Beat of Life coordinates three key programs, including one called Beautiful Minds that focuses on people suffering from mental illness. 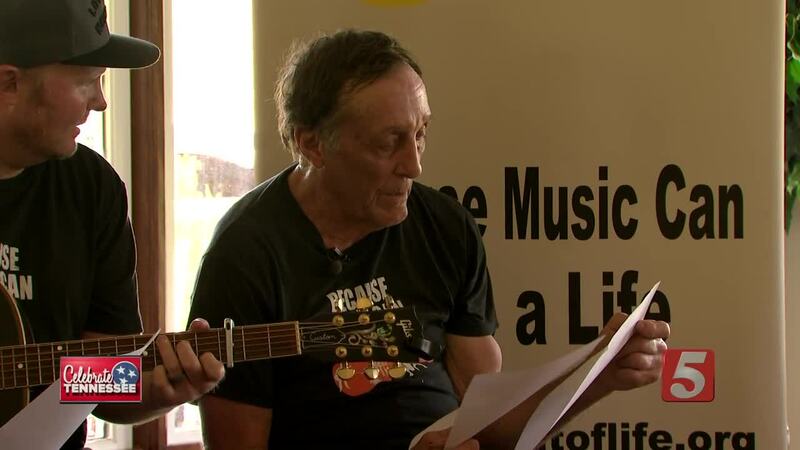 This year, the program brought volunteer songwriters to the Center for Living and Learning in Franklin , which houses 26 residents battling depression, suicide, and other brain disorders. The center was founded by Fran Clippard, who realized her brother Donald had no other options. At 16 years old, Clippard decided to dedicate her life to helping her brother and people like him. In 1986, the opened the Center for Living and Learning on a 30-acre farm just outside of Franklin. Today, there are four houses on the property with 26 residents receiving medical care, counseling and employment assistance. They’re also able to participate in therapeutic activities like painting and gardening. The center’s goal is to rehabilitate residents so they can rejoin society, though some choose to stay at the center indefinitely. This summer, the Beat of Life brought songwriters to the center to write with the residents. With the help of Keese Timmer and Sarah Jane Nelson, Donald penned a song about his sister’s work to help those with mental illness. Timmer and Nelson spent two hours working with Donald to turn his story into a song. The result is titled ‘Kid Sister' which is available for purchase on iTunes. That song, and many others written by people like Donald, will be featured on the Beat of Life’s debut album, which will be available for purchase September 30 on iTunes and on the Beat of Life website . Kid sister, had my back since we were young. Lord knows hard time have come, but you ain’t ever run. Kid sister, you been with me most my life. You never left my side, like you could’ve been. I was big and you were small. But you stood up for me like you were ten feet tall. And I know it ain’t always been easy. Been more than a struggle or two. But in the darkest of night, you were my light. I thank God for kid sisters like you. When I hit my first homerun, that thing was really gone. Just up and disappear, but you’ve stayed strong. And I don’t know where I’d be. Cuz each day you rescue me and you say that I am the blessing. Bad times 'bout all we been through. But in the darkest of night, you’re still my light. If you’d like to support the Beat of Life, click here .